After a rough week in Washington, the Packers return home to Lambeau Field Sunday to face the Buffalo Bills with a a chance to get to 2-1-1 in this young season. And they have something to prove after laying an egg in the nation’s capital. On the other side, the Bills are coming off one of their best weeks in a long time, dismantling the Vikings for their first win of the Josh Allen era. Mike McCarthy, Mike Pettine, and company are looking for a bounceback week in every aspect, from execution of the plays to properly getting loose to avoid soft tissue injuries. This is one of the best weeks to do it, with Buffalo viewed as a below average team, last week notwithstanding. After getting another interception from Ha Ha Clinton-Dix against Washington, the Packers defense is looking for more against a rookie quarterback with below average weapons around him. Josh Allen relied on a smart gameplan last week against Minnesota with a lot of quick passes against a Vikings defense that has struggled with physical play on the boundary so far. If the Packers can play press coverage on the outside, especially if Kevin King can return to the lineup, then Allen may have to hold onto the ball longer, leading to some late and/or forced throws. Throw in the return of Lesean McCoy to the backfield and ball security is a big risk for the Bills. McCoy is still dealing with a rib injury and has never been exactly known for his security with his running style. The opportunities will be there for the Packers, and Mike Pettine’s group will finally get multiple turnovers. While Mike McCarthy has been gameplanning to get Graham touches in the passing game, and he should have one touchdown already as a Packer, he’ll finally be able to get into the endzone against Buffalo, and he’ll do it twice. Depending on how coach Sean McDermott decides to matchup with Graham, he’ll either be facing a rookie linebacker in Trumaine Edmunds, or a couple undersized safeties in Jordan Poyer and Micah Hyde. As good as those two safeties are in coverage, they have a significant disadvantage going against the size of Graham. Aaron Jones will run for over 100 yards. Aaron Jones looked great in his first action last week, running for seven yard per carry and showing the burst to be the best home run threat out of the Green Bay backfield since Ahman Green. And he drew praise from his quarterback this week, as Aaron Rodgers stated in a locker room interview that he would like to see Jones out there more. I have no reason to believe that McCarthy will go against his quarterback’s wishes, for better or worse, and that’ll help Jones for the better. He’ll get 15 carries at least in this game to slow down the Bills pass rush, and it’ll lead to him hitting the century mark in the game. Game Prediction: After a brutal Week 3, the Packers rebound with a big win over the Bills to get to 2-1-1. They win 37-17. 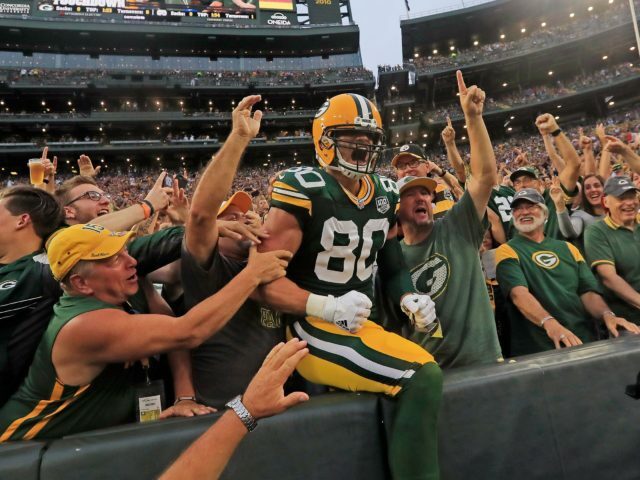 This entry was posted in Authors, Mike Wendlandt, Packers 2018-2019 Season, Seasons and tagged 2018 NFL season, Bold Predictions, buffalo bills, Green Bay Packers, Week 4. Bookmark the permalink. If Bulaga can’t play for 60 minutes, I’d sooner entrust my teenage daughter to Donald Trump for the weekend than any of the back-ups. Washington has changed my feelings about the team and the season. I just think the Packers are not as good as I thought they were. I’ve lost confidence in them, really. The injury bug is hitting badly and the refs seem to have it in for the team, for some reason. And the Bills will field Trumaine Edmunds whom I wished the Packers to draft. I still think it was an error to eschew his services as, by some miracle, he was still on the board when the Packers were picking. He’d have gone some way to solving the Packers’ anaemic pass-rush. The anemic pass rush is 6th in the league. Pass defense starts with people who can cover and we went out and got some. Opposing QB passer rating is in the top ten, too.